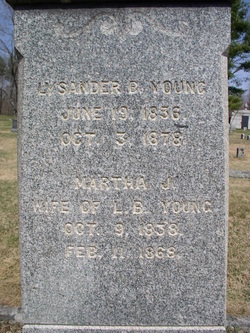 LYSANDER BASCOM YOUNG, the son of James M and Susan P (Henderson) Young, was born in NH [census records; Descriptive Roll says South Berwick] on 19 June 1836 [grave]. He died on 3 Oct 1878 [grave] in Fall River, MA [MA death rec], and was buried in South Berwick's Portland Street Cemetery. He was married to MARTHA J WINN, intents filed 27 June 1856 [Vr of Berw, So Berw and No Berw, pg 380]. She was born in Maine [census recs] on 9 Oct 1838 [grave] and died 11 Feb 1868 [grave]. She is buried in Portland St Cemetery, South Berwick. III. EVA M YOUNG,[called Susan Eva in Wentworth Gen; Martha S E in 1870 census] b. Aug 1864 [1900 census; 14 May 1864 in Wentworth Gen, pg 457] in South Berwick; died after 1920 census. She married, on 1 Sept 1886 in Fitchburg, MA [MA vr], to FREDERICK E RAITT. He was born in Portsmouth, NH [marr rec] about Aug 1862 [1900 census], the son of Jeremiah and Sarah Raitt. He died in Fitchburg, MA on 9 Aug 1909 [MA vr]. He was for many years a policeman, and by 1900, a letter carrier. They lived in Fitchburg, MA. 2. Kenneth Frederick Raitt, b. 15 Apr 1892 in Fitchburg [MA birth rec]; d. after 1930 census. He marr Mary Margaret Shea on 27 Apr 1916 in Rockingham, VT [VT vr]. They removed to Des Moines, Iowa [WWI Draft Reg Card], where their twin girls (i. Marjorie M and ii. Evelyn M Raitt, born ca 1918) were born, returning afterwards to New England and living in Hartford, CT [1920,'30 censuses]. He was an insurance examiner. Wentworth, John. The Wentworth Genealogy, English and American Vol. 1, pg 457, lists Lysander's full name (not seen any where else), and only lists daughter "Susan Eva"'s name, the other two "died in infancy".